When signing in with Google (OAuth), it shows a list of accounts it already knows about. How can I remove some accounts from this list? I know I can nuke all of them by deleting all cookies, but I'd prefer to remove one account that I don't want there, rather than all of them. There used to be an ability to edit this list in the older version of this screen, but in 2018 redesign Google has removed [×] buttons next to the accounts. Sign out of the account you want to remove. Click on the accounts drop down menu (top right). Click the signed out account. You'll see overlaid options to Remove or Sign In; click Remove. Not the answer you're looking for? Browse other questions tagged google-account google login or ask your own question. How can I remove my user name from a friends Google login page? How do I remove an account from Google multi-login? How to remove an account from Google login options? 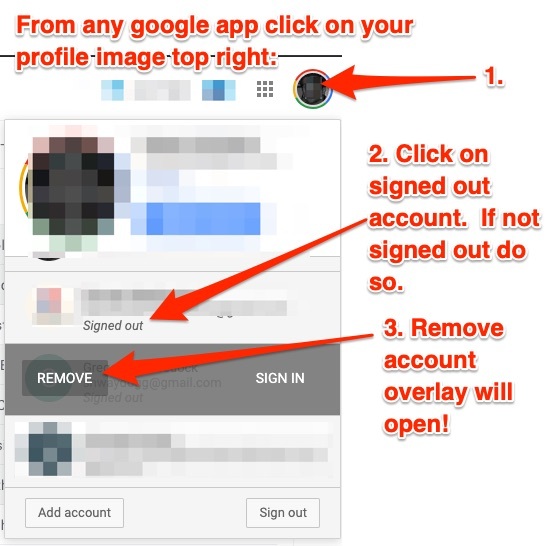 How to choose the default Google account for a Google service? How to access photos previously in Google Panoramio?